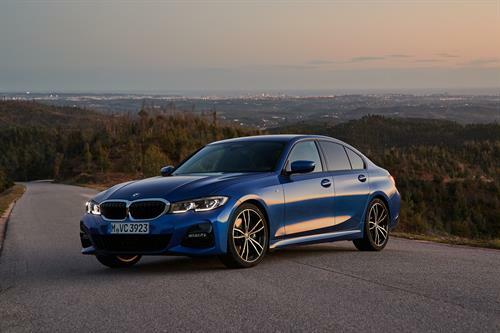 BMW‘s evergreen 3 Series has been given a substantial makeover for its impending release. The seventh generation of the car, first released in 1975, will come to Australia for a March 2019, on sale date. There’s a two model range on offer, with the 320d priced from $67,900 plus on roads (includes GST and LCT), and the 330i from $70,900. An xDrive M340i M performance model will hit our shores later in 2019. The 3 Series stays with a 50:50 weight distribution with the additional benefit of a weight loss of up to 55kg. Body rigidity has gone up by 25% to 50% which helps handling, along with the wider front and rear tracks for extra grip. A revamped suspension also comes into play, with a redesigned front end having more camber, and variable damper ratings allowing for 20% stiffer spring rates. BMW’s Adaptive M suspension system is here, with electronically-controlled dampers. 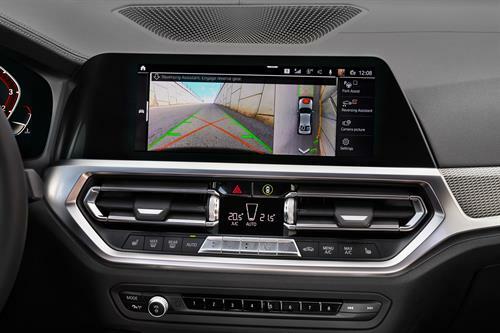 This system offers comfort- and sport-focused modes that are changeable in-cockpit. 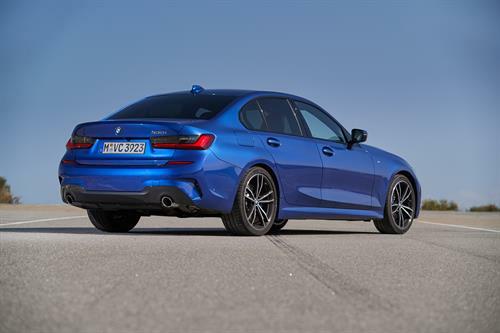 It combines the 10mm lower ride height and geometries of the M sport suspension standard in the 320d. M Sport brakes with blue callipers are standard on the 330i and have four pistons up front, and one piston rears. Handling can be further improved by opting for the M Sport differential with variable torque distribution. An exterior redesign has a one piece grille and the LED adaptive twin headlights up front, a redesigned and sharper look to the iconic Hofmeister kink, and reprofiled taillights with a smoky glaze. The diesel will have a choice of 18 inch diameter alloys, with the petrol fed version having 19s. BMW have bitten the bullet on the options list too. 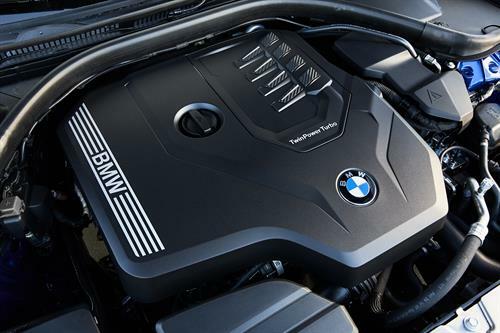 The M Sport Package is standard and the Luxury Line package is an option at zero cost. BMW says the M Sport Package brings the following elements to the 3 Series: BMW Individual High-gloss Shadow Line, with black window frames and air breather surrounds, M Aerodynamics Package with aerodynamic front and rear bumper sections and side sills, BMW Individual interior Headliner in Anthracite, M Leather steering wheel with multifunction buttons, Interior trim finishers in Aluminium Tetragon, 18-inch M light alloy wheels in bicolour, double-spoke design (320d), 19-inch M light alloy wheels in bicolour, double-spoke design (330i), and M Sport Brakes (330i). Choose the Luxury Line pack and there are: Leather Vernasca upholstery, Interior trim finishers in fine-wood, high-gloss ash grey, Sport leather steering wheel, Instrument panel in sensatec, Sport seat for driver and front passenger, 18-inch light alloy wheels in bicolour, multi-spoke design (320d), and 19-inch BMW Individual light alloy wheels in bicolour, double-spoke design (330i). Interior space has been increased as well thanks to a 43mm wheelbase increase along with an increase of width of 16mm. 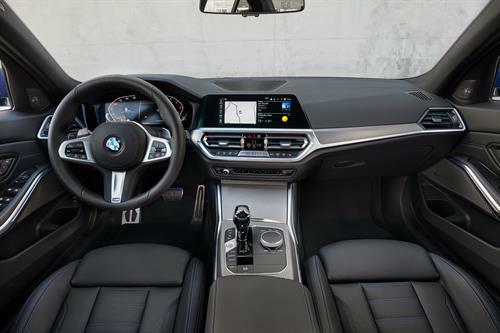 Backed against an increased level of trim quality are improved support from the electrically adjustable sports seats, a choice of 3 wood and 2 aluminiom trims, and BMW’s Operating System 7.0. This incorporates a 12.3 inch hi-res display screen for the instrument cluster and a 10.25 inch centre console display screen. New for the 3 Series is Head Up Display, standard on the range. Naturally the safety standards are high with Lane Change and Lane Departure Warnings, amongst others, as standard. Contact Private Fleet to see what we can do for you on price, and contact BMW for more details.